The simple, unappealing name does not do justice to this fine film. Who would want to see a movie called "The War?" Not, me, and that's why I only saw this 1994 movie tonight, on TV. And I was pleasantly amazed at how good it is. Costner turns out to have a very strong "supporting" role because the movie really is about Elijah Woods' character and the other kids who find out about the real war we human beings seem to fight daily. Excellent mix of humor, action, drama, sadness, and triumph. The "dare" scene inside the water tank was one of the more gripping I've seen in any film. I rate it "8" but almost feel it deserves a "9". Feb 2006 update. I saw it again, on DVD, and most of the movie was fresh again. 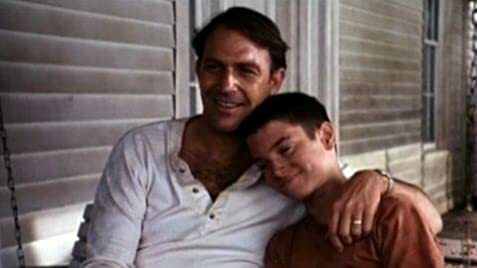 After Costner's character was faced with killing people in the Vietnam war, he fully understood that love was the only thing fighting for. This is what he was able to pass down to his son and daughter. As they say, in any 'war', even the ones we may fight with our neighbors, we always lose track of the real reason we are fighting and destroy the things we value. The cigarettes Elvadine smokes in the movie are herbal, not tobacco. Amber's hands after she jumps from the tree with the rope. When the credits are over and the music ends, we hear a helicopter.